Secured with hair clip. Ideal for special occasion or to accessorise a quirky goth/steampunk outfit. White flower fascinator with beading,feathers and hanging cream netting, set on a cream headband weddings, races prom. Flower Corsage,Hair clip. This sale is for a Very pretty Full Flower Satin and Net. Has a Hair clip and pin attached for wearing as corsage. Material: Lurex ribbon, crinoline, satin ribbon, feathers beads and clear diamanté. Colour : Navy Blue with silver. Turquoise Fascinator Hat on a fabric covered headband that can be concealed mostly by your hair. This hat is available in a variety of colors. Beautiful Fascinator of a sinamay bows and biot feathers attached to a satin covered headband. Large Headband Fascinator. Colour : Coral. 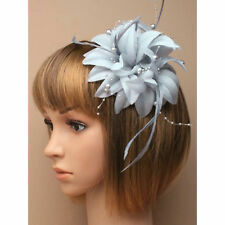 Beautiful hair accessory ladies silver grey flower fascinator with feather tendrils. Set on 7cm clear comb. Ladies blue fascinator on a comb, made from sinamay and feathers. Materials:feather, net, lace, beads, fabric. Set on a thin aliceband / headband. Beautiful cream white flower fascinator with beads. All Black Formal Fascinator juliet cap and headband with lace beading and feathers. suitable for weddings, races or prom. Elegant Fascinator with Net & Feathers. one hot pink fascinator. The black version on the model is only for style consideration. Hat Base Size: about 14.5cm x 11cm / 5.7" x 4.5". Color:Hot Pink. There is the risk. 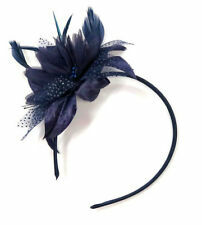 Navy Blue Feather Comb Fascinator. Clear comb suitable for all hair types. Stunning feather detail. 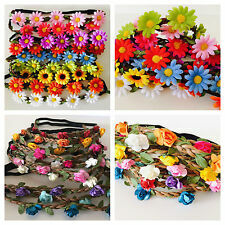 Can be worn anywhere on your head. 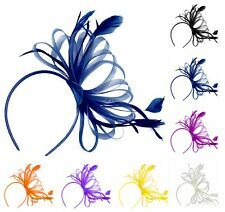 This quality fascinator is mounted on a 0.5cm satin headband so is comfortable to wear and easy to conceal. 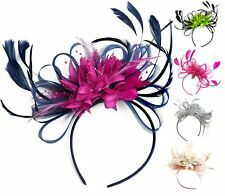 Approximate size of fascinator is approx. 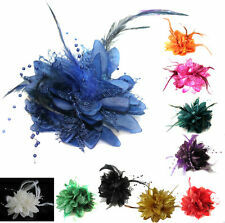 A Beautiful and Stylish Fascinator with Flower and Feather Detail adding a touch of Elegance to your Outfit. Large Aliceband Hat Fascinator. Colour : Silver. Latex Kitty ears. and then fitted onto a latex covered alice band. MADE ON A 7 1/2" X 4" RED SINAMAY HAT BASE ON BACK IS AHAIR COMB. 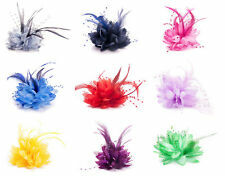 FEATHERS MAY BE DIFFERENT FROM HAT TO HAT BUT WILL BE VERY SIMILIAR. CAN BE WORN IN MULTIPLE POSITIONS BUT HAS AN ELASTIC CHIN STRAP THAT CAN BE WORN ANY WAY THE CHOICE IS YOURS.